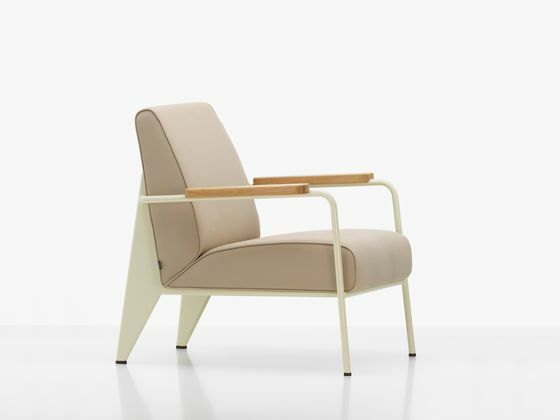 Fauteuil de Salon joins simple planes into a unified architectural object with a comfortable seat surface and backrest. Rediscovered in the archives of the French engineer Jean Prouvé, the armchair has been updated in a contemporary colour palette. With oiled, solid wood armrests and the designers characteristic structural aesthetic, the Fauteuil de Salon can be ideally combined with other pieces in the Prouvé Collection. Polyurethane filling; leather or fabric cover. Solid wood with oiled finish; natural oak, smoked oak or American walnut. Hard 04 glides for carpet or 05 felt glides for hard floors. He left his mark on architectural history again in 1971, when he played a major role in selecting the design of Renzo Piano and Richard Rogers for the Centre Pompidou as chairman of the competition jury. Prouvé's work encompasses a wide range of objects, from a letter opener to door and window fittings, from lighting and furniture to façade elements and prefabricated houses, from modular building systems to large exhibition structures – essentially, almost anything that is suited to industrial production methods. In close cooperation with the Prouvé family, Vitra began in 2002 to issue re-editions of designs by this great French constructeur.